ABC’s action-comedy series Batman (1966–68) famously offered a dual address in its wildly popular portayal of a comic book hero in a live action format. Children uncritically accepted the show’s plots and characters, who were guided by lofty ideals and social values, while adults reacted to the clear parody of the values on display. In Batman, author Matt Yockey argues tha ABC’s action-comedy series Batman (1966–68) famously offered a dual address in its wildly popular portayal of a comic book hero in a live action format. Children uncritically accepted the show’s plots and characters, who were guided by lofty ideals and social values, while adults reacted to the clear parody of the values on display. 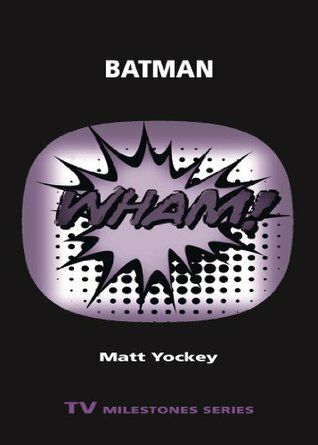 In Batman, author Matt Yockey argues that the series served as a safe space for viewers to engage with changing attitudes about consumerism, politics, the Vietnam war, celebrity, race, and gender during a period when social meaning was increasingly contested in America. Yockey examines Batman’s boundary pushing in four chapters. In “Bat-Civics,” he analyzes the superhero as a conflicted symbol of American identity and considers the ways in which the Batman character parodied that status. Yockey then looks at the show’s experimentation with the superhero genre’s conservative gender and racial politics in “Bat-Difference” and investigates the significance of the show’s choices of stars and guest stars in “Bat-Casting.” Finally, he considers how the series’ dual identity as straightforward crime serial and subversive mass culture text set it up for extratextual production in “Bat-Being.” The superhero is a conflicted symbol of American identity—representing both excessive individualism and the status quo—making it an especially useful figure for the kind of cultural work that Batman undertook. Batman fans, from popular culture enthusiasts to television history scholars, will enjoy this volume.